Cities: Skylines is an award-winning management game now for PS4 with all of its robust city-simulation gameplay and unique charm along for the ride. Build the city of your dreams! Plan road networks, bus lines and parks. Create smog-filled industrial estates or a quiet beach town powered by renewable energy. Manage policies, energy and economy and play the popular After Dark expansion and make your city a different place at night. 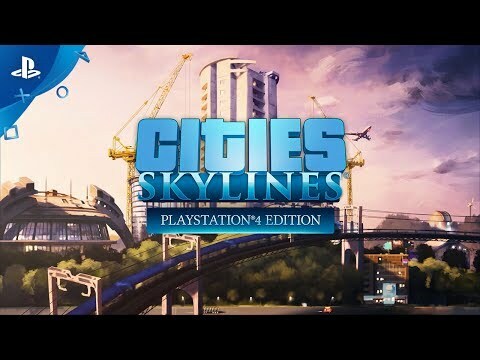 Cities: Skylines – PlayStation®4 Edition puts you in charge of a growing city – from the ground breaking of its first streets to the ever-changing needs of thousands of citizens. Design, build, and manage the city of your dreams, from public services to civic policies, and challenge yourself to grow from a simple town to a bustling metropolitan hub. Multi-tiered and challenging simulation: Playing as the mayor of your city, you’ll be faced with balancing essential requirements such as education, water electricity, police, firefighting, health care and much more, along with your city’s economy. Citizens within your city react fluidly, keeping you on your toes with ever-evolving demands.